Here is another FREE printable baby book page! Today’s page is a gender reveal page. Of course, not everyone decides to find out the gender while pregnant, but you can always use this as a gender reveal to add to our book after the baby is born. This is the GIRL example, but there is also one for a boy. This one will be so exciting when you get to put it into your baby book! Get creative with it! 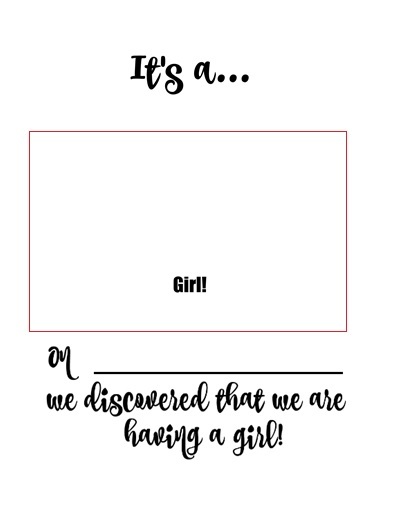 With the way it is designed, you can place the ultrasound image (or image of baby if you decide to be surprised) right over the word “boy” or “girl”, tape it on either one side or just the top, and create a flip-up reveal to show the gender. So, right in the box shown in this example is where you would tape your image. Remember, only tape on a single side so that the image can be flipped up or flipped to the side to reveal what the gender is! Get creative with this page! Add stickers, washi tape, stamps, and more to personalize this page even further. Enjoy, and thank you for visiting Being Mrs. Parry.